Have you always dreamed of having a perfect smile? Tired of looking in the mirror only to see crooked teeth greet you while you brush? You’re not alone. It’s rare for people to be born with perfect teeth. That’s exactly why your orthodontist in Danville is offering multiple options to fix your smile forever. To learn more about these treatments, check out the post inside. How Can Orthodontics Benefit My Smile? People may not realize that braces do more than just improve the way your smile looks. Straighter teeth can help patients chew, bite, and sometimes speak better than with crooked teeth. It also becomes easier to brush when your teeth are properly organized in a straight line. If your mouth experiences malocclusion, also known as a “bad bite,” it can lead to problems with the temporomandibular joint or TMJ for short. A bad bite can cause ineffective chewing and ergo, digestive problems, so the sooner you correct this the less likely you’ll see problems. What Different Kinds of Braces are Available? Since the conception of orthodontics, braces have had years to grow and develop. Multiple variants were made to cater to patients of all different backgrounds. Below, we’ll break down a few of the different types of braces currently out there. Traditional – Today, standard braces are lighter in weight and structure. They’re made of high-grade stainless steel and contain metal brackets. These brackets are attached to each tooth with dental cement and are linked together via an archwire which puts pressure on the teeth, pushing them to shape your new smile. Ceramic – These are similar to traditional braces, only the brackets are made from clear, transparent ceramic material. They tend to be more appealing to adults seeking orthodontic treatment. Damon – These braces realign teeth in less time because they don’t need to be adjusted by the doctor. 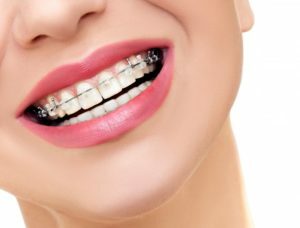 Using a sliding mechanism instead of elastics to connect archwires, patients spend less timing visiting the orthodontist and have a gentler mouth-straightening experience. For those looking for a less metal experience, multiple companies have been jumping on the clear aligner bandwagon because it’s been shown to give adults a straighter smile in less time for less money. They look similar to mouth guards except instead of only wearing them at night or while playing high-impact sports, you wear them for most of the day. Companies like Invisalign provide custom-made clear aligners designed to straighten your teeth over several months. Unlike braces, they are removable, so you can eat all the foods you normally do without worry of them getting stuck in your teeth. Your orthodontist will likely have you wear a retainer after the initial treatment period to ensure your smile stays straight. Schedule an appointment with your orthodontist today to learn more about your treatment options! Dr. Chris Payne earned his Bachelor of Science in Biology from the College of William and Mary in 1998, followed by his Doctor of Dental Surgery Degree from the Virginia Commonwealth University’s Medical College of Virginia School of Dentistry in 2003. Out of 2,000 hours of continued education, his most extensive training has been in Invisalign and orthodontics. To learn more about Danville Dental’s practices, you can view their contacts page here.